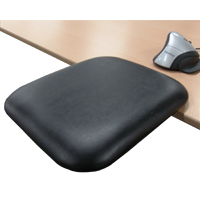 The Posturite Mouse Rest supports the weight of the mousing forearm in situations where chair arm rests may not be able to be raised high enough to offer the necessary support, or may not even be present. The leatherette-covered, 8.7" deep by 7.5" wide support is comfortably padded to reduce the potential for pressure points on the forearm. A convenient clamp-free mounting system (designed for use on desk tops approximately 1" thick) lets the Mouse Rest be repositioned easily, or removed as needed, allowing users to switch between their right and left hands for mousing. The off-centre mount also enables users to configure the Posturite Mouse Rest with either 2" or 3.5" of desk overlap--permitting them to customize it to their forearm length or to their desired usage style. Caution: The Posturite Mouse Rest elevates the forearm up to .75" over the desk height. Be sure to take this measurement into consideration when establishing the correct height for seating. 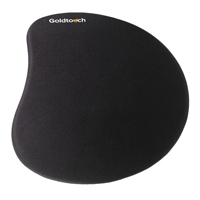 This kidney-shaped Goldtouch SlimLine Mouse Pad from Key Ovation provides excellent tracking for any mouse. The firm gel core is covered with Lycra that facilitate easy movement of the mouse and reduces contact friction on the forearm, wrist and hand. For enhanced comfort a softer gel zone provides greater cushioning and comfort for the heel of the hand. 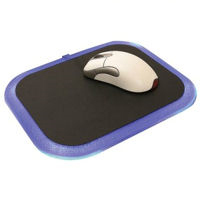 This can be beneficial for users with sensitive pressure points or bone spurs on the wrist.The corner-free shape and softly rounded edges soften the transition from work surface to mouse pad. The SlimLine Mouse Pad is just 0.375” thick and is available in left- and right-handed versions. The non-skid backing ensures that the mouse pad remains securely in place on the desk top. 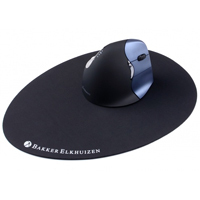 Made by Bakker Elkhuizen, "The Egg" Ergo Mouse Pad is a low profile mousing surface with thermal insulation designed to maintain bloodflow by keeping the wrist and hand warm. At 9" wide by 11.8" deep, "The Egg" Ergo Mouse Pad is large enough to be placed along the front edge of the desk, ensuring the wrist and hand are fully supported, without compromising the space available for forward mousing movements. Note: The front-to-back depth of this mouse pad may make it incompatible with standard-sized keyboard trays. "The Egg" Ergo Mouse Pad is made of eco-friendly recycled rubber embedded with anti-bacterial nano technology. The smooth, even surface ensures the mouse tracks accurately, and the non-skid base ensures the mouse pad remains securely in place throughout the work session. Note: This product is not covered by our 30 Day Customer Satisfaction Guarantee. 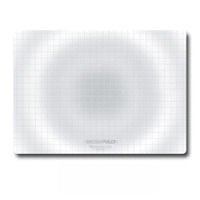 The WowPad Laptop Mousing Surface by Microthin is an exceptionally thin (0.38 mm) mouse pad made of one single ply of antibacterial, chemically inert polyvinylchloride (PVC). The top is ideally suited to provide a precise tracking surface for optical and laser mice. The patented “sure-grip” bottom securely adheres to any smooth surface. Simply clean the mounting surface, press down firmly and the WowPad is secured to the surface. The mouse pad seamlessly integrates on the worksurface and is easily cleaned to the desired degree, using hot water or even soap, industrial cleaners and disinfectants (for applications where hygiene is a prime concern). The Laptop WowPad can function well as a writing surface superior to most common desk surfaces. While protecting the desk surface it provides a convenient location to jot down notes in a prime area while not actively mousing. Numerous patter options are available in both retail sleeves or in environmentally friendly bulk packaging for orders of 2 or more units. Note on Cleaning WowPads: The bottom can be cleaned with alcohol or glass cleaners. 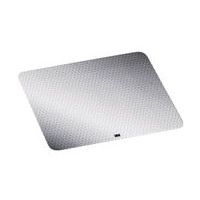 Le WowPad Laptop Mousing Surface par Microthin est un tapis de souris exceptionnellement mince (0.38 mm) fait en une seule couche chimiquement inerte de polychlorure de vinyle (PVC) antibactérien. Le dessus est idéal pour offrire une surface précise de suivi pour les souris optiques et lasers. La conception brevetée du dessous “sure-grip” qui l`aide à être fixer sur n`importe surface lisse. Simplement laver la surface que le tapis va dessus, l`appuyez bien dessus et le WowPad est sécuriser sur la surface. Le tapis de souris s`intègre parfaitement sur la surface de travail et est facilement lavable, en utilisant de l`eau chaude, ou avec du savon, du nettoyant industriel et antiseptiques (pour applications ou l`hygiène est la première préoccupation). Le WowPad Laptop Mousing Surface fonctionne aussi comme une surface d`écriture supérieur aux surfaces communs des bureaux. En protégeant la surface de bureau, il offre un endroit approprié pour prendre des notes dans une zone primaire durant le temps que la souris n`est pas utiliser. Il est disponible avec nombreux options de dessins, tous disponible dans une pochette au détail, ou dans un paquet respectueux de l`environnement pour les commandes de deux tapis ou plus. Le Laptop WowPad est conçu pour être un tapis portable qui est utile pour les endroits temporaires. Pour l`usage général, on recommande de choisir entre le Tray Sized Mousing Surface models ou or la plus petite WowPad Circular Mousing Surface. Veuillez noter pour nettoyer les WowPads: Le dessous peut être nettoyer avec de l`alcool ou avec de nettoyant pour vitres. 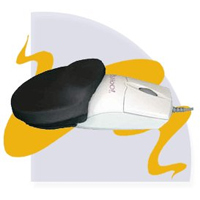 This product gently supports your palm and provides a mobile palm rest which attaches to most mice. The PalmGlider is preferred over the LaunchPad when the user must move the mouse over a broad area. Glides with the mouse reminding the user of proper posture -- while providing full-time support. Excellent for drawing in graphic design and desktop publishing with mice, CAD digitizer pucks and tablets, and with CATIA work stations. People that instinctively grip the mouse excessively will find their need to grip the mouse reduced. Fingers control the fine detailed movement -- enhanced by the palm support -- as the constantly supported upper extremity [palm to wrist to arm] glides the mouse over broad areas. The base is a lamination of materials engineered for easy gliding and to be gentle on the desktop or digitizer tablet. 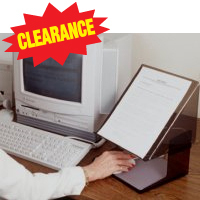 The Mouse Manager enables the user to place documents, books and binders at eye level, reducing eye and neck strain, and creating a mousing area in a more comfortable location. 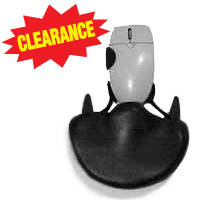 The Mouse Manager is constructed from durable plastic and is available in smoke (darkly tinted) or clear. The Mouse Manager can hold documents in a variety of shapes and sizes, from a single page, up to fifteen pounds of paper. This slim mousing surface is great for desktop and laptop computers. Its micro-textured high-contrast surface enhances the precision of optical mice. Use the repositionable adhesive to stick the mouse pad to desks or stow it on the back of your laptop. The two-in-one design of the Gel Mouse Pad and Document Holder keeps the mouse, and up to five sheets of reference materials, within the user's Comfort Zone. Measuring 13" x 7.5" x 10", the mouse pad requires little space on the desk top. 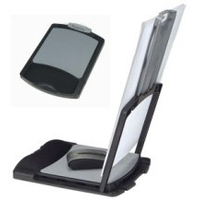 A clip at the top of the flip-up document holder secures papers, and a non-skid base and cable management feature help to keep the work space organized. The mouse pad also features a gel-filled, lycra-covered palm support. NoteWe are unable to offer our 30 Day Customer Satisfaction guarantee on this product. The Mouse Mate from Humanscale fits most standard mice, providing additional support for your palm while allowing it to rest in a neutral position. Constructed of foam rubber and polyurethane.